The lowest price of OPPO F3 is P7,500 at Taiyen General Merchandise, Ame Czarrief Cellphone Shop, Shanylle General Merchandise and BOSH ANTHON TRADING, which is 66% less than the cost of F3 at Lazada (P21,989). The latest price of OPPO F3 was updated on Apr 19, 2019, 09:56. OPPO F3 put the manufacturers firmly on the mobile device market. One of the most popular and well-received, it still continues to drive sales despite the larger next-gen F3 Plus entering the market. This device now enters the mid-ranging market with just those features. OPPO F3 is a stunningly sleek device with rounded corners and edges. A solid all-metal body, its symmetrical design is what wins over buyers. The single capacitive button up front, 3 on the sides and an iPhone-like rear camera placement singles it out in the crowd with ease. OPPO intelligently curved the rear end in for a confident grip and easy one-hand usage, although users will need to stretch a bit. Up front, it does sport a dual front camera. The 7.35 mm thin profile weighs in at 185 grams. To sum it up, this device is suave, sleek, sturdy and compact without a doubt. Coming to the front camera setup later, this is one of the most surprising winning features in this device. This 5.5-inch IPS LCD has a native screen resolution of 1920 x 1080 pixels. Considering that this is a mid-ranging, an FHD display module of this quality is a rarity. Graphics quality and depth are simply stunning and way above expectations even when it was first launched thanks to a 386 PPI pixel density. OPPO F3 scored high on multi-core performance figures as it runs on a Qualcomm Snapdragon MSM8976 Pro processor also known as the 653 series Snapdragon. It has an Octa-Core setup with core speeds going all the way up to nearly 2.00 GHz. This is rated as one of the best image processing setups around. And that's because it comes with an Adreno 510 series GPU (Graphics Processing Unit) which comes in handy for strong multi-media performance. Also, it is compatible with X9 LTE providing download speeds of 300 Mbps, thanks to dual-channel network support. Coming to what sets this device apart, it has a 16 MP primary image-capture camera aided by an 8 MP wide-angle lens module. Together, this setup can process images sharply and quickly. The wide angle allows added subject coverage and depth while the 16 MP adds quality to give users the best selfies they can expect. Multiple added filters also come with custom image enhancement apps. An added Dual-Tone LED flash along with the f/2.0 aperture allows umpteen image quality in low light conditions. The rear camera is a 16 MP which is on par with its counterpart. It comes with a similar aperture setup and PDAF (Phase Detection Auto Focus). OPPO F3 also has a Pro mode where users can adjust shutter speed and other settings for stunning still imagery. 4K video recording capabilities come up with strong results too, thanks to added OIS (Optical Image Stabilization). OPPO F3 works on a 4 GB RAM. Internal storage comes in at 64 GB. You can extend its external storage to a maximum of 128 GB via microSD slots. This device runs on a Non-removable 4000 mAh Lithium Ion battery and it comes with quick-charging tech and apps. OPPO F3 is based on an Android 6.0 Marshmallow and users have the option to install the latest updates straight. OPPO's in-house UI software Color OS works over the stock Android for more added functions. This device will continue with ColorOS 3.0. Philippines are an important market for OPPO. Hosting a number of manufacturers as well as a rising economy, Philippines are considered a vital market especially in the mobile device segment. 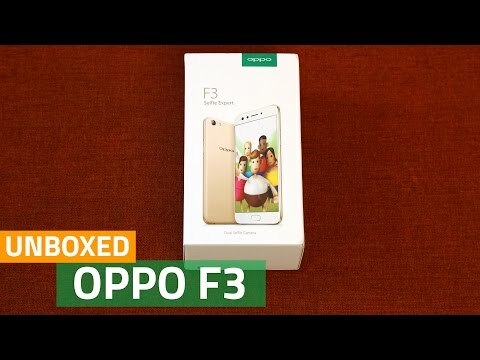 OPPO F3 was always a popular device and with the release of the latest F3 Plus, this device takes all of its own plus points to the mid-ranging segment. Sales in Philippines are strong and look likely to continue. OPPO F3 ang ganda ng phone na ito! ask ko lang po mag kano po presyo ng f3 pag second hand na ?? Indeed OPPO F3 is a selfie pro camera kaya gusto kung bumili nito kasi selfie lovers talaga ako matanong ko lang kung GB yong internal storage niya at ilan yong expandable memory support na kaya niya . Maganda po ba maglaro ng NBA 2k17 sa f3 ? Tnx ..